How do you take something incredibly challenging, and make it easy? Change: it surrounds us in all directions. We couldn’t escape it if we tried. There are small changes and BIG changes but invariably, there are also “uncomfortable” changes. A little change over time we can live with. Things like having to get a new car, aging, or not being able to take that vacation, are all generally psychologically manageable. BIG changes on the other hand, like having to uproot ourselves and our families in order to find work; losing our jobs, our homes, or both; and losing a loved one; are not so easy to overcome and can create great burdens on our psychological well-being. Last month I wrote about the inevitability of change on a grand scale. I focused on the changes that are before us now and on even bigger changes that may be required of us in the future. This month and next, I will continue the series on change and will focus on how to integrate and manage change on a personal level, beginning at home; beginning with you. So, just how do you ease the pains of BIG change? You get really good at dealing with “small change”. You become an expert at it, in fact. You become a Doctor of Small Change. Consider this your new title and wear it proudly because once you get good at this, you deserve to brag about it. Ever notice how when you’ve mastered something it becomes second nature? Usually you can no longer even speak the common language around the subject because you know it so well. Embracing change could be like this….just a blip on the radar of your journey through life. Change can be a source of great suffering but it doesn’t have to be. Change is also exciting evidence of the fact that you’re alive! Change provides a wonderful opportunity to grow, to expand and to see yourself in new and promising ways. Imagine if things never changed. How boring would that be? 1) Take all the routines you practice on a daily basis and do them differently. If you drink coffee, drink tea. If you always make your bed, this month, skip it. If you always go to the gym in the morning, go for a walk or sit in a cafe instead. If you always take the same route to work, choose another. If you always put your yoga mat in the exact same space up front, move to the back of the class! The purpose here is to help break the patterns that define your life and to realize these “routines” you cling to, are merely manifestations of your mind. What once was designed to help organize your time has perhaps now become a ball and chain of your own making. It will not be the end of the world if the dishes aren’t washed tonight, I assure you. 2) Clean out closets and drawers and get rid of everything you don’t use or need. There is no better “fix” than letting go of things you don’t need – or even don’t like for that matter. All of this stuff is just dead weight hanging around your house anyway. Clean out, move things around, organize in new ways. Clean out all your old paperwork too. Create space for new energy to emerge. If your closets and homes are overflowing with stuff you don’t like or need, you’re blocking the way for new creative energy to enter your life. Let it ALL go. Be liberated from your attachments. These are just two suggestions to start you in the right direction. They may seem simple, but I assure you they are effective. Work on these two exercises for at least a month. Stick to the challenge and give yourself the chance to be successful. Begin to notice how you yourself are changing as you make these small changes in your daily life. Do you feel more energized? Lighter? Spontaneous? Free? You will, and you will love it! We have the freedom in our lives to choose how we react to the world around us. By embracing change in small ways and by inviting change into our lives rather than waiting for it to happen, we empower ourselves with the confidence and “know-how” to overcome bigger changes when they do come our way. Imagine facing BIG changes with a feeling of liberation and opportunity. One day, you could! Bend like a willow to the river of life. Jump in feet first and unabashedly learn to go with the flow. 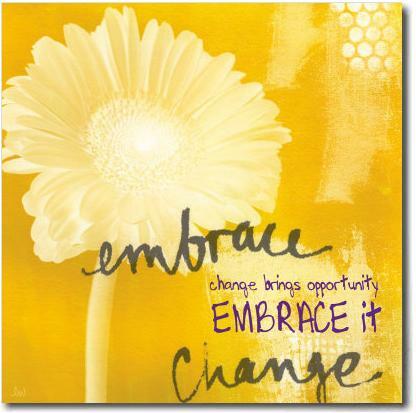 Change Happens – Embrace it! This was very inspiring. I just got a new job and there are going to be many more changes to come in my life. Thanks for the encouragement.